Presently Associate Professor (Communication/ Soft Skills, Human Resource Management) at JIMS, Rohini . 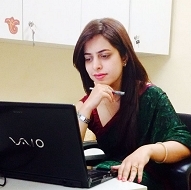 An MBA with specialization in Marketing from Rajasthan University. An academic experience of more than 9 years in the area of HR/OB, Business Communication and Soft skills. Graduated with Bachelor’s in Information Technology from Manipal University and B.com from University of Delhi.